However, with every home theater comes the problem of high volume and noise to others. Due to this, sooner or later, you probably will have neighbors knocking on your door asking you to turn it down. One solution to this problem is to soundproof the home theater room in your house. The first items of priority are the windows. Generally, windows don’t require a lot of work. Hence, you simply need to first strengthen the windows’ ability to block the sound energy. This can be done by sealing the windows with acoustical caulking compound. This prevents drafts anyway. Then, cut thick (2”) closed cell foam mat slabs to fit inside the frame. Make it a press fit which will seal the edges. Don’t push up against the glass, leave an airspace. You must cover all the windows completely this way. As with floorboards and windows, sound is capable of easily traveling through doors. 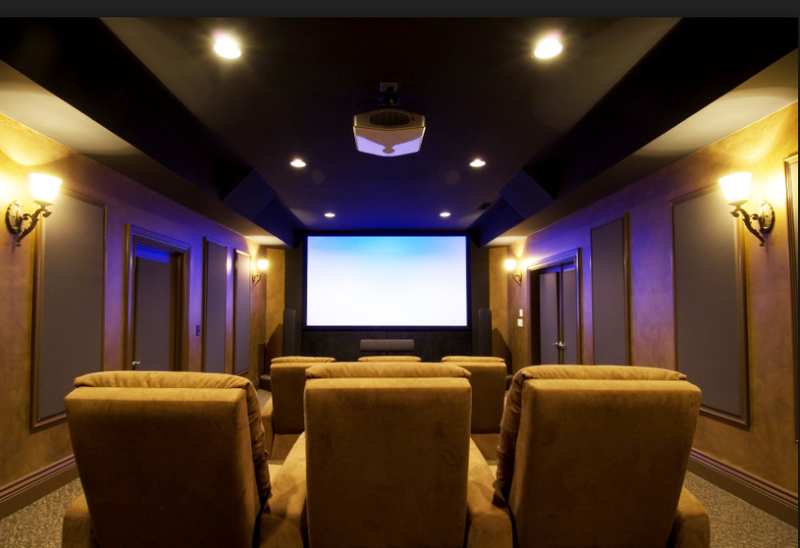 Considering that your home theater will be an enclosed room, you will need to ensure that the doors are soundproofed. If you are used to playing your audio system at high volume, the easiest thing to do would be to install an additional door. For this, you should use a Medium Density Fiberboard (MDF) slab door. Doors can have padding on the interior as well as the exterior. The interior padding should be deliberately oversized. This allows it to act as a seal at the crack around the doorpost. When combined with the bottom edge door-sweep already present, it will create an air lock, thus ensuring that no sound will leak out from the room. Some people might suggest soundproofing the room halfway to save money. But if you want to have the true home theater experience, it is always best to soundproof all of the walls completely. The leading soundproofing option for walls is Mass Loaded Vinyl (MLV) sound barrier. This consists of non-reinforced, high temperature “loaded” vinyl. The material is designed to be heavy, yet very easy to cut and shape. It will double the walls sound blocking ability if covered with another layer of sheet rock. It is important to ensure that the lights are not built into the ceiling. If the ceiling is soundproofed, then you don’t want any holes through which sound can pass. You can suspend light fixtures or use thin low profile fluorescents. If your ceiling already has built-in lights, then you can add more soundproofing materials around them unless there is a heat issue. These are the four aspects you need to consider when soundproofing a room for your home theater. With proper sound proofing, you can enjoy your favorite films at the volume you desire.